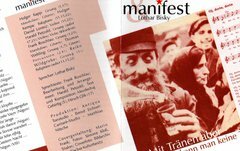 Founded in 1973 – like it was called back then – as a central culture group in the Pedagogical Highschool Potsdam, “manifest” evolved with the five members (who aren’t Jews) a regional respected interpretation of Yiddish music (or Klezmer) since the beginning of the 90th. The repertoire of the group consists mainly of Yiddish songs, tunes and dances of the eastern European Jews. In their program “But you can’t sate tears with tears” they relate a fictive Jewish life history with the inspiration of letters, narrations and texts of the Jewish author Joseph Burg. The repertoire of the group includes also Jewish songs, stories and dances about all occasions of life. At the moment the group members are Marian Herrmann (bass guitar), Holger Kapp (guitar, mandolin, vocal), Harald Petzold (fidl, violin, viola, vocal), Marcus Pilarski (cello, vocal), Thomas Wehling (guitar, vocal, percussion). Klezmer Music dates back to the eastern European Judaism (ascenasm) tradition. Still in the 15th century Klezmer was developed as a secular (non lithurgish) Jewish music that was performed by folk musicians called Klezmorims. Because of the migratory lifestyle some Rabbis just despised them and so they developed a special music “of the streat” – of the “schtetl”. The main instruments were violin (the fidl), dulcimer (Tsimbl), contrabass, cello, flute (later clarinet) and percussion. The repertoire of the group includes pieces that were played on weddings and public festivals. The fascination of this music is the connection between (musical) ecstasy and human despair. Important musical forms are, as dances, the multipart “Freylekhs” (little jaunty pieces) between major and minor, Bulgar (round dancing) or Nigun (played for the Chassidim’s) and often also the easy Jewish songs. In Germany since the 70th the Klezmer music is played more and more in the genre of “world-music”. Today in Germany exist many Klezmer-groups who play original interpretations as well as combinations with elements of Jazz, Rock and Pop. Many composers (like Bernstein, Gershwin, Schostakowitch, …) were inspired by Yiddish music. The group needs for all gigs 3 chairs without armrests. „Meine jüdischen Eltern, meine polnischen Eltern“. Jiddische Lieder und Tänze mit Texten von Josef Burg, gelesen von Lothar Bisky.